Henry Darger is a self-taught artist whose life’s work was discovered in his Chicago apartment in the months before his death in 1973. His thousands of drawings, paintings and manuscript pages for two unpublished novels, including a vast fantasy epic featuring the often-violent adventures of naked hermaphroditic children known as the Vivian Girls, have intrigued art historians and artists. Darger’s work was brought to the attention of the art world in 1977 at the Hyde Park Art Center/Chicago and in 1997, when the American Folk Art Museum in NYC mounted an exhibition of his work. Later, in 2008, the museum presented Dargerism: Contemporary Artists and Henry Darger, which linked his work to artists on the curator’s (Brooke Anderson) radar. What could have caused Darger to create such lurid and often gruesome imagery (that included naked little girls, some with penises)? That question has lead to much speculation; there are a lot of articles written about Henry Darger. But the problem with these articles: he is not here to defend all the theories and speculations that have been written mostly by art historians. Also, he never expected his work to be seen or his personal life to be picked apart. In regards to his imagery, under any other circumstance, a landlord cleaning out a tenant’s apartment, might have looked at books containing the Vivian Girls and thrown them into the garbage. His landlord, Nathan Lerner, had an astute understanding of Chicago imagism and thankfully sensed Darger’s work was unique and potentially important. Lerner was rewarded; he and his wife, Kiyoko Asia, made a fortune carefully selling his work, placing it in esteemed collections. 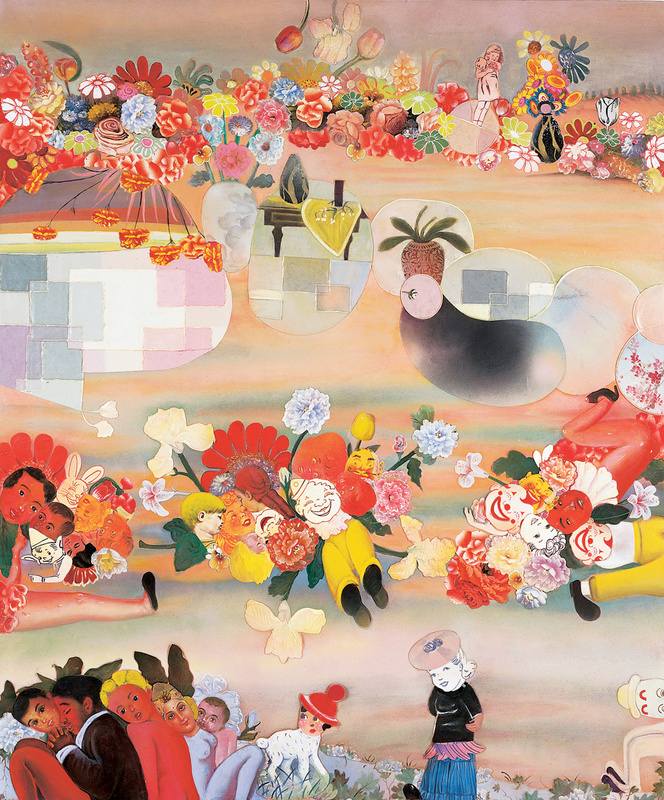 All of Darger’s artistic efforts went towards a child-like depiction of an imaginary planet, complete with all sorts of submerged eroticism. However, inadvertently, he actually was carrying out a Chicago tradition of figuration that included theatrical, emotional, sexualized, and invented characters that nevertheless appeared “real.” The Chicago Imagist Movement of the 60’s and 70’s often depicted figures in a fantastical and surrealist manner. Darger has influenced many younger artists – including myself, partly because of his tracing skills, his color, and his compositional strategies. As a painter, I am also interested in creating an imaginary miniaturized world, as a portal to melancholy and loss. Art historians contemplate Darger’s “back story,” what the images mean, usually dissecting his peculiarities. I concentrate on his hand and composing skills. How did Darger, formally untrained, pull off such sophisticated and impressively complex moves, involving color juxtaposition, indexing strategies, and emotional pitch using tactics that today read as entirely contemporary? Henry Darger also satisfies my other requirement for art; that the work communicate to the viewer the immediacy and the rich worlds of one’s interior life. There are certain human experiences shared by most people: the need to be loved, the psychological consequences of being human, and the twists and turns of truth manipulated by duplicitous thinking. Since Darger’s work parses these experiences out in many ways, I have never been interested in critics that censor him, specifically for his sexually ambiguous imagery (penises on little girls). I work with eroticized images that are often misunderstood, misdirected, and complained about. I am not comparing myself to Darger, rather pointing out how we have intersected. There are many differences, but we share a mutual need for some form of “story.” We are both interested in concocting interior worlds that reflect notions of good and bad behavior. Our illusionary landscapes act as moral amplifiers. I refer to this as “love and affection in a hostile world.” The index of recurring motifs and images in Darger’s work extends the conversation of the never-ending story – intensifying the constant, roiling yearning of his heroines and their quest. I share this constant desire and yearning in my work, but my characters change and my “stories” reflect my own personal peccadilloes!